Julien is a thoughtful person who has absorbed the art and the science of winemaking and decided to branch out with his own wines made from grapes sourced from some very good terroirs in the area. We first tasted his wines at an event in Avallon near Chablis and we were entranced by their purity and charm. So we asked if we could import his wines as well. Julien and Carole Schwab have now bought the Domaine Derain business in addition to their commitments to the Sextant domaine and will be making the Derain wines from now on (with Dominique still in the background!). We love the fact that Julien is quite restless and is always searching for new challenges. It was therefore inevitable that he would make a skin contact wine using white grapes to produce an orange wine as they are known. And the name he came up with is amazing – you guessed it – Skin Contact! The wine is made from the wonderful Aligoté grape variety from a north-facing vineyard in excellent terroir near the famous village of Pommard. The grapes (50% destemmed and 50% whole bunches) were crushed and then, instead of the juice being run off, it was left in contact with the skins for a ten day period allowing the anthocyanins and other polyphenols in the skins and pips to leach into the juice. The presence of the anthocyanins from the skins turns the wine a light orange colour and some of the other polyphenols extracted during the maceration give the wine a lovely rounded mouth feel. This is a very complex wine that is only available in tiny quantities, but we have been lucky enough to obtain a few cases for the Australian market. 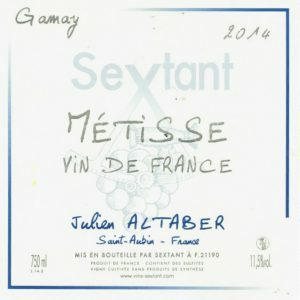 This is the third year that Julien Altaber has produced this wine following the successful launch of the first vintage which he has gave the name Métisse because it was a mix of both white and red grapes. 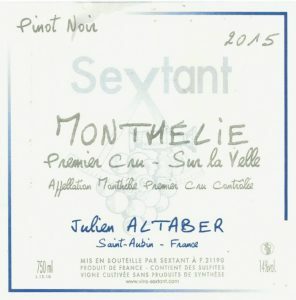 This year it is made only from Gamay without the addition of 5% Chardonnay as per the first year he released this wine. Once again, the Gamay is sourced from the Beaujolais region. For this reason he has given it the broad Vin de France designation. However, don’t take any notice of the Vin de France designation this wine is a stunner – it is one of the best examples of Gamay that we have ever tried!!! It is a bright, lively and delicious (and very smashable) wine at a very good price for such a thrilling wine. 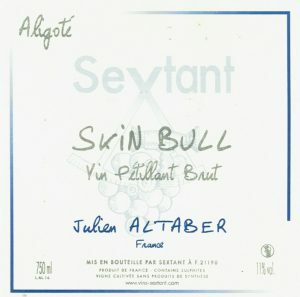 Julien has taken his skin contact wines one step further this year with the release of a sparkling skin contact wine made from the Aligoté grape variety. The wine is made from the wonderful Aligoté grape variety from a north-facing vineyard in excellent terroir near the famous village of Pommard. The grapes (50% destemmed and 50% whole bunches) were crushed and then, instead of the juice being run off, it was left in contact with the skins for a ten day period allowing the anthocyanins and other polyphenols in the skins and pips to leach into the juice. It was bottled with residual sugar to allow the fermentation to continue to produce a nicely sparkling pet nat! This wine is made from 100% Gamay sourced from organic producers from the Domaine Picatier in the Cote Roannaise where the soils are granitic. The grapes were partially destemmed and then macerated for 10 days before being transferred to fibreglass tanks for maturation for 6 months. The result is a lively, fresh, easy drinking red wine. 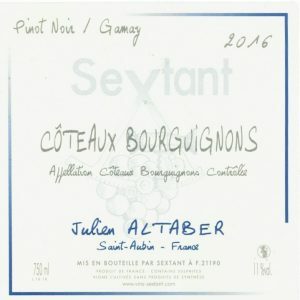 This is the first time that Julien has produced a wine under the Coteaux Bourguignons appellation. This is a relatively new appellation which is literally translated as “Burgundy Hills”. This appellation was introduced in 2011 as a replacement for the confusing Bourgogne Grand Ordinaire appellation. It covers all of Burgundy including Beaujolais. This wine is made from organic Gamay and Pinot Noir sourced from the Challonaise area in southern Burgundy. This wine was matured in a 1400 litre foudre and the finished product is absolutely delicious. 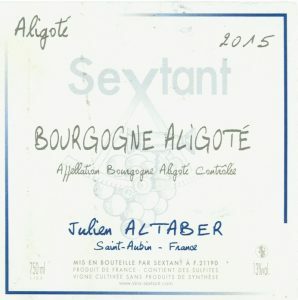 We love Aligoté, especially when it is grown in great terroir. Unfortunately in Burgundy this grape is often relegated to lesser areas and Chardonnay is given priority. However we have been lucky with our suppliers because they have either been handed down great vineyards or they have found them. 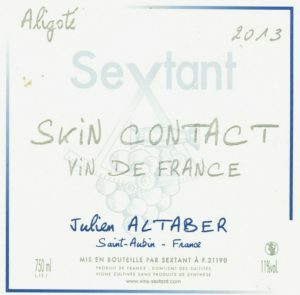 Fanny Sabre’s father loved drinking Aligoté so he planted some in the rich, red soils of the famous Pommard commune, Alice and Olivier de Moor have their old-vine Aligoté in the emerging Saint Bris area, Yann Durieux found a vineyard quite close to that of DRC in the hills behind Beaune, Dominique Derain has his almost adjacent to the famous slopes of Puligny-Montrachet and, now, Julien Altaber has bought an old (60-70 years old) vineyard in the village of Puligny-Montrachet on alluvial limestone soils as well as a small parcel in the La Combe lieu dit in Saint Aubin which is actually a specific clone of the grape variety called Aligoté Doré. This is a very, very good example of an Aligoté with a nice backbone of acidity that allows it to be used with a wide range of foods. It is lip-smackingly delicious. This is a Vin Mousseux made in the same style as a Pet Nat which we have written about many times before. 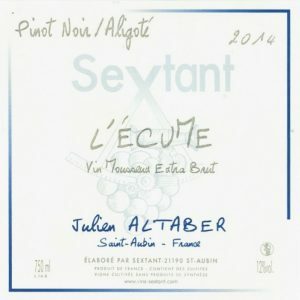 In 2014 he made the wine from a mix of Pinot Noir with a small amount of Aligoté whereas in 2015 he has used equal parts of Gamay and Aligoté – both are delicious. However what he has come up with is a bright, juicy, lively wine with a lovely mouth-feel and lingering flavour. It is very smashable. Here is what the Ordinaire Wine Bar in Oakland, Califormia had to say about tasting this wine in Juien’s cellar. We all swirl, taste, and then swallow. When no one spits a little smile cracks in the side of Julien’s mouth. The wine is showing well—full of energy and irrepressible fruit, but unlike any of his other cuvées. Just the thing to have around for an impromptu toast to a friend, or for a cheese plate oozing with Epoisses. Take it home and put it in the fridge. You’ll be thankful you have one cold. We were delighted when this wine arrived in Australia because it had not suffered from the journey at all. The first bottle of this 100% Chardonnay was alive and vibrant. The taste lingered on the tongue and the length was very pleasing. 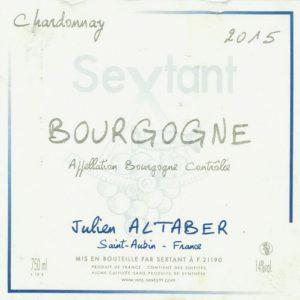 Although it is labelled as a humble Bourgogne Blanc, the vineyards that Julien maintains around Saint Aubin and in the Cote Chalonnaise (near the village of Montbellet, are on very good terroir, similar to the nearby Puligny Montrachet where outstanding white wines are produced. We look forward to the evolution of this wine. nothing fancy pants or extortionate, just beautifully grown, traditional wines from the heartland of chardonnay. This wine belies its humble Bourgogne Rouge tag. It is made from grapes picked from his vineyards around the village of Saint Aubin which is one of the emerging villages for both white and red Burgundy. About half of the grapes for this 2014 vintage were destemmed and there was less pigeage this year as Julien is becoming more confident about letting the grapes do the talking. It is a silky Pinot with some elegance and structure. We like it a lot!. This silky premier cru Chardonnay is a new line from Julien and a very good one it is. 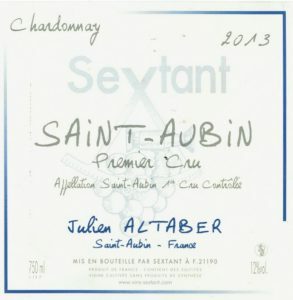 It once again shows that the Saint Aubin appellation is capable of producing outstanding white wines due to the quality of the limestone soils here. The plot is from one of the very best areas (La Chateniaire and La Combe au Sud) of this very good appellation and the careful handling of this cru wine shines through. Once the wine is pressed the wine is transferred into two old wooden barrels where it is left to mature until bottling. We are amazed at the finesse and depth of this outstanding wine and we think it can give many of the nearby Puligny wines a run for their money! The famed vineyards of Puligny-Montrachet lie south of the town of Beaune. In this region some of the most famous white wines in the world are produced. Les Reuchaux is a very good site with good exposure and excellent soil. This village-level appellation is emerging as a site for excellent white wines yet at prices that are around 25% of their more famous nearby cousins. The soils here are brown limestone alternating with marl and clay. We only received a very small allocation of these wines and we expect them to sell quickly to savvy buyers. 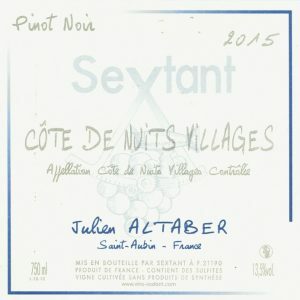 This delightful Pinot Noir is a village level appellation wine from the northern part of the Cote d’Or. Remember that the Cote d’Or is divided into the Cote de Nuits in the north running from just below the outskirts of Dijon down to, but not including the village of Pernand-Verglesses. It is in this area that you find such famous wines as Gevrey-Chambertin and Chambolle-Musigny to name a couple of appellations where you don’t have to sell your house to buy a bottle! It is a beautifully structured wine showing notes of red berries and cherries with finely integrated tannins. You might even detect some of the characteristic Gevrey flavour in this wine! There has been no sulphite added to this wine and the alcohol level is a sensible 12%. If you drive south out of Beaune on the D973 you very soon pass through the famous wine villages of Pommard and Volnay and then arrive at Meursault on the left side of the road and Monthélie on the right. The Monthélie vineyards are, in fact, very close to some of the finest vineyards of Volnay! It is definitely an appellation to watch. The soils are excellent, the exposure good and the proximity to the other fine appellations means that great wines are possible here. This is a very fresh and lively wine with good tannin structure, lively acidity and flavours of cherries and red berries. If you are looking for a wine from an emerging and exciting appellation then you should give this one a try! Julien has recently bought a plot of land in the newest of the Burgundy appellations – Maranges. This wine is made from 100% Pinot Noir (the appellation does allow red wines to include small amount of Chardonnay, Pinot Gris and Pinot Blanc). This village lies just outside Saint Aubin and exhibits very good terroir which is why the area has been elevated to AOC status. Philippe Essome who was one of the founders of the famous Ten Bells bar in New York and who now runs a natural wine shop called Passage de la Fleur also sells this wine in magnums and says “So fresh, so light, so goooood…”.